In an era when disagreements are all too common, it’s hard to find common ground. However, if there’s one unifying thought among most people, it’s that the biting cold of winter makes finding the motivation to do anything difficult. Freezing winds and the inevitable dusting of snow serve as two constant—and cold—reminders that sometimes, it’s just better to stay inside. And while lounging under a warm blanket and sipping hot drinks is a great way to tune out the winter doldrums, it’s also an easy way to start packing on the post-holiday pounds. There’s no shame in that, of course, but if you’re one of the millions of gym-averse, running-reluctant people in the world, winter ranks as the hardest season to stay fit. Thankfully, County Lines has a few recommendations for simple—and sometimes silly—ways to sneak in some additional exercise during winter. There’s an episode of The Office where Dunder Mifflin employees deal with the frustrations of an out-of-order elevator. In the grand scheme of things, it’s a non-issue, but on a list of life’s most annoying minor inconveniences, being forced to take the stairs has to rank high. But what if I told you a growing number of people are choosing to climb stairs as their primary form of exercise? Would you believe there are even stair-climbing races where competitors ascend some of the country’s tallest skyscrapers as fast as possible? Actually, towerrunning races, as they’re called, are held around the world, in such places as the Eiffel Tower and Empire State Building—the latter with 86 flights, 1576 stairs and a speed record of just over 9.5 minutes. Stair climbing is generally considered one of the best-kept secrets in outside-the-gym fitness. It’s a free, low-impact workout that’s astoundingly simple: find a staircase in your area and start climbing. Outdoorsy types can find online resources chronicling lengthy sets of public stairs around the globe. Finding a building tall enough for indoor stair climbs can be a bit more difficult, and checking with the property’s management is always recommended. But if you can find a solid set of stairs, get walking (or running) up them, stick with it and reap the benefits in weeks. According to StepJockey, an organization dedicated to increasing workplace wellness, climbing a single step burns around .17 calories. By that math, ascending one flight of stairs burns 2 calories. It might not sound significant, but breaking the numbers down on a minute-by-minute scale shows that stair climbing is comparable to jogging. Consider it a better alternative to running in the winter months. And if you enjoy stair climbing, why not take it to the next level? Philly hosts a few indoor stair climbing races, including the Fight for Air Lung Climb—50-stories up Three Logan Square on March 30—or the Big Philly Climb—a 46-floor hike up the FMC Tower. 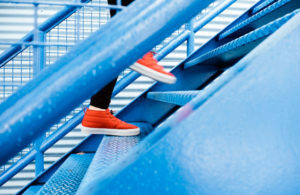 Both events require preparation and a penchant for pushing yourself up an unfathomable number of stairs, but completing the challenge is the ultimate test of stair climbing mastery. As author Charles Baxter once pointed out, “there is no weather in malls.” Because of this, the distinctly American covered chapels of capitalism have endured popularity among groups of exercise seekers. You’ve probably heard, or seen, mall walkers at your local shopping oasis. But have you ever considered taking a leisurely stroll yourself? Mall walking, as you might expect, is a straightforward exercise. Malls are generally well lit and flat, making them an ideal location to walk around and burn a few calories. As an exercise, mall walking is a great option for senior citizens, given the climate-controlled locations. Of course, it’s hardly an elder-exclusive exercise, and many towns have dedicated mall-walking groups. 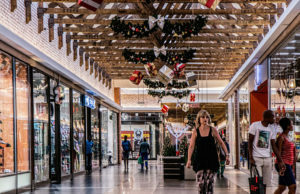 With the Exton Square Mall and King of Prussia Mall nearby, you’re likely only a few miles away from a safe place to walk throughout the winter. It might not be the most glamorous form of fitness, but mall walking comes with an added entertainment bonus: there’s plenty of people watching and window shopping to do. Death and taxes might be the two best-known certainties in life, but dealing with snow during a Chester County winter is an annoyingly high probability. When faced with the prospect of icy roads and slippery conditions, many people would rather hunker down and avoid leaving the house once snow starts falling. If you find yourself stuck at home due to a snow storm, consider using frozen precipitation as an off-beat method of working out. Anyone who has ever shoveled a driveway knows that snow can be deceptively dense. Because of this, a winter wonderland can quickly become an impromptu outdoor gym. Playing in the snow, as it turns out, is an excellent form of resistance training. Think about it. 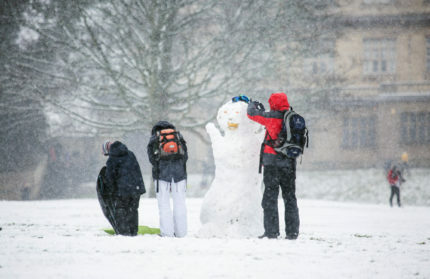 Something as simple as building a snowman is a great way to work out specific muscle groups. Recreating Frosty isn’t just for children—rolling, shaping and building a snow person works your legs, back and arms. And if you’re feeling hungry after, just take a bite of the carrot nose when no one’s looking. If you have kids, consider moonlighting as a reindeer once the snow falls. Have the little ones climb into a sled and start pulling them through the winter wonderland. It’s a less glorified version of strongmen dragging 18-wheelers, sure, but it’s probably much more adorable. Your kids will thank you, and you’ll get a great workout, too. It’s not uncommon for people to dislike the snow as they get older. Without the prospect of school closings or early work dismissals, snow can seem like a drag. Greet the next snowfall as a training partner instead of a weather-based annoyance and maybe, just maybe, you’ll burn enough calories to enjoy a cup of cocoa loaded with marshmallows once the sun goes down. Look, we’re not here to judge. The County Lines staff is a decidedly pro-television group. We talk about our favorite shows, the upcoming series we want to watch and lament we can’t spend every day binging reruns of Parts Unknown. It wasn’t until recently, though, that we discovered a way to watch TV and sneak some extra activity in too—without cumbersome exercise equipment tucked in front of the flatscreen. Allow us to introduce you to active TV watching. You can thank us by renewing your subscription to the magazine. Like the other exercises in this article, active TV watching is so simple you’ll be disappointed you didn’t start doing it sooner. Here’s what you do: put on your favorite show, start watching and use commercial breaks to pump out a few jumping jacks, push-ups or laps around the house. If it sounds silly, that’s okay. You’re doing it from the comfort of your own home. Odds are the only people who see your active TV exercises are your closest confidants and family members. They’ve all seen you do weirder things, I’m sure. The proposed introduction to active TV watching assumes you’re viewing programs on regular cable broadcasts. In our digital world, there are plenty of streaming services that cut out commercials entirely. Fear not. Netflix has a countdown between episodes. Since you’re not dealing with commercial breaks when streaming, take the time to pause between episodes—don’t let the next one start automatically—and get your exercise in. Consider doing three sets in rapid succession to make up for the missing commercials. If you watch enough TV and commit to an active viewing lifestyle, you’ll be in better shape (and considerably more media literate) by the time spring starts poking through the cloudy skies.